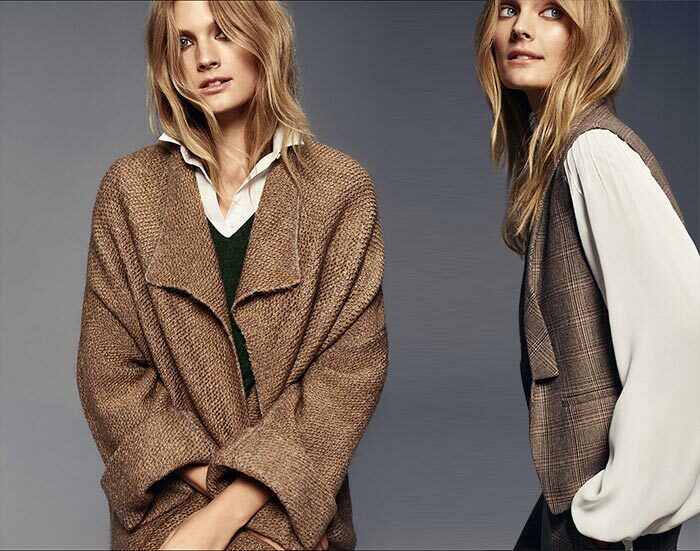 Warm, sensual and confident, Massimo Dutti‘s Urban lookbook for fall 2015 featuring Constance Jablonski shows the Spanish brand’s new, powerful attitude. Little by little, Massimo Dutti has won its audience’s affection thanks to its usage of high quality fabrics, which always guarantee comfort and style. This same attitude along with fine tailoring seem to be the focus of the new line, coming to make modern fashionisers’ winter chicer and cooler. Despite the Italian name, Massimo Dutti is a Spanish clothing manufacturing company founded in 1985 and part of the Inditex group since 1992 (it is the same group that owns fashion brands like Bershka and Zara). Its style has always celebrated independent, urban and cosmopolitan men and women (and even children, since 2003), whose looks span from the most elegant to the more casual styles. While for its summer 2015 collection Massimo Dutti chose a more equestrian style, and for its fall/winter campaign the brand asked for Mario Testino’s artistic eye and Cameron Russell’s impressive poses, for its Urban fall 2015 lookbook the brand enlists model Constance Jablonski to showcase their masculine-infused outfits along with her ethereal yet very self-confident attitude. The French-born model, who wasn’t even interested in the fashion industry at all before becoming a model, presents eight distinctive looks here, which all have a strong urban chic style in common. The entire collection may be seen as a fantastic blend of boyish and feminine looks, which all reveal Massimo Dutti’s version of what a cosmopolitan woman should wear this season. Although the very first look featuring a pair of chic tailored pants and a vest worn over a shirt has a pure mannish spirit, it is interesting to notice how it also appears to be the most sensual and feminine outfit among the others presented. While the second look introduces some more conventionally feminine pieces, like the mid-length leather skirt, the third look loves playing with the collection’s main theme, combining a warm diagonal structured waistcoat with a pair of thick corduroy bell-bottom trousers, which help the silhouette reach a more balanced and slender figure. Wide-leg herringbone trousers, a white poplin shirt and a long black coat give the next look an effortlessly urban-chic turn, letting the following outfit take a more casual-chic allure. Here Jablonski is pictured wearing a delicate boho-chic outfit composed of an ethereal oversized blouse embroidered in a floral motif on the front yoke. While looking straight into the camera, Jablonski’s big blue eyes and chic messy hair seem to perfectly match Massimo Dutti’s masculine-chic pieces, which include a must-have structured kimono coat as well. Despite being just 24, this young model managed to draw more attention onto herself rather than the clothes, which could actually be more beneficial for the brand itself. Is Jablonki going to become the female muse for the brand, like their favorite male model Sean O’Pry? We hope so!